Low-dose radiotherapy (LDRT) for pain reduction in osteoarthritis (OA) is a frequently used treatment in Germany and Eastern European countries. The evidence on the effects of LDRT on pain in patients with OA remains unclear. This study evaluated the effect of LDRT on pain in patients with severe OA of the hip or knee joint. This prospective study included a total of 16 joints in 12 patients (4 hips and 12 knees). The inclusion criteria were: patients older than 50 years, severe OA (Kellgren–Lawrence grade III–IV) of the hip or knee joint, patients not responding to conservative treatment and patients who are inoperable or not willing to undergo surgery. The joint was irradiated with a total dose of 6.0 Gray. The Numeric Rating Scale for pain (NRS-pain) and patient-reported outcome measures were obtained at pre-, 6, 13, 26, 39 and 52 weeks post-radiation. A decrease of two points on the NRS-pain was defined as clinical relevant. The median age of the included patients was 74 years (range 58–89). 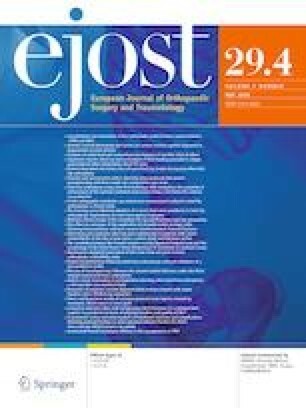 In 50% of the joints (n = 8, 3 hip and 5 knee joints), a clinical relevant difference in pain at 6 weeks post-radiation was observed. This clinical relevant difference decreased to 25% at 52 weeks post-radiation. LDRT showed a clinical relevant pain relief at 6 weeks after radiotherapy. The long-term effect of LDRT, however, was limited. A randomized placebo-controlled trial is necessary to assess the effect of LDRT on pain in patients with OA of the hip or knee joint. The authors would like to thank Esther G.C. Troost (MD, PhD) for her expertise of radiotherapy and Wouter Gronheid (MD) for ensuring the accuracy of the data.